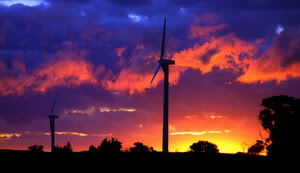 For centuries wind power has played a major role in human history. As long ago as 5000 years wind was used to sail ships down the Nile in ancient Egypt. There are records from China 3000 years ago where they used windmills to grind grains and pump water. The first true windmill is believed to have been built in 2000 BCE in Babylon. By the 10th century AD, windmills were grinding grain in the area now known as Afghanistan. The western world did not catch up until the 12th century. These too were used to mill grain. It was a few hundred years later that they were modified to pump water, and reclaim Holland from the sea. The familiar farm windmill from the American west was developed in the late 1800's. Until implementation of the diesel engine, railroads depended on these windmills to pump water for steam locomotives. Farm windmills are still in use today to pump water for livestock water tanks. Without them, beef production over large areas would fail. In the 1920s and 1930s thousands of electricity producing windmills were in production in the US. By the 1950s however, local grids began to reach the isolated areas and the windmills fell out of favor. Then in the 1970s the oil crunch made us more aware of the unavailability of oil, and a resurgence toward wind power was born. Since then, Federal and State tax incentives, and government research projects have reduced the cost of implementing residential wind turbines. 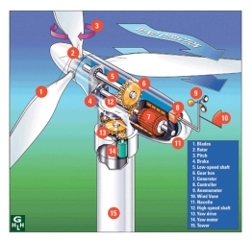 How do residential wind turbines work? The wind turbine typically stands on a high tower in order to catch the prevailing wind. 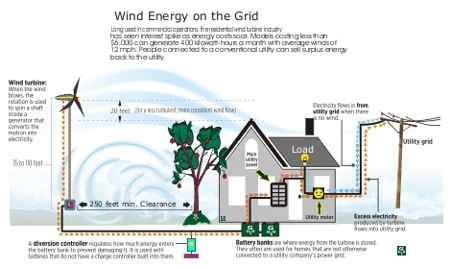 In a typical installation the home is still connected to the local power grid, so that when the winds are slow, the homeowner will purchase power from the utility. But when the wind is blowing, the wind turbine can produce enough wind power to not only light up a house, but to also sell some electricity back to the power company. A wind power system in a remote location does not have a grid, so it will need batteries in order to store the extra power. Will a wind turbine save me money? Yes, it can save you between 50-90% off of your electric bill. In some areas people have had power bills as low as $8.00 a month. The amount of money that is saved depends on the size of the unit, how much power you actually use, and the average wind speed in your area. In the US, wind power receives a tax credit for each kilowatt hour produced at 1.9 cents per kWh as of 2006. The credit has a yearly inflationary adjustment. Many states also offer incentives such as exemption from property taxes and "green credits". The other main incentive is the benefit to the environment. Wind power uses no fossil fuels, emits no carbon dioxide, sulfur dioxide, mercury, particulates or any other type of air pollution. There is a slight danger to birds and bats, but according to the Audubon society more birds are killed by cars than wind turbines per year. How would I install a wind turbine in my home? Most dealers offer a turnkey (ready to operate) installations or the option to purchase direct from the factory and install it your self. Self installation offers significant savings, in fact you can now build a wind turbine yourself. Please download this consumer guide to help you along. Our thanks for the windmill photos, courtesy of Wikimedia Commons.